Oh to be a twentysomething snowboarder enjoying the alpine delights and wiling away the evenings in the company of fellow singletons, the only worry being whether you are going to have the stomach to get your gear on come the morning. 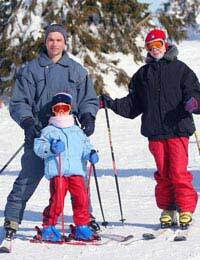 For winter sports enthusiasts who have more than their own fun to think about when it comes to planning a trip, those far off days when children hadn’t even entered your head seem idyllic. But the truth is that just because you now have your own little snowmen or women, it doesn’t mean your hopes of a little me-time on the piste will be lost in a flurry of nappy changing, lunchtimes spent dissuading junior from throwing pieces of breadstick at the adjoining table, or persuading a difficult teenager that you don’t have to be “bored, bored, bored” 24/7. All you have to do is ensure everyone is catered for – and for most families, that means choosing a resort that is child friendly. So check out the facilities and ask as many questions as possible. For example, what are the opening hours of the crèche, what qualifications do the staff possess, and how many of them speak English. Yes, addressing the locals in their native tongue is courteous and can bring its own rewards, but the kids are only going to feel alienated and upset if they can’t connect verbally. For older children, enquire about the facilities for junior tuition, as well as post-piste clubs or events that will allow them to interact with people of their own age. Remember that as they grow, the desire to explore new friendships rather than be tied to mum and dad for the whole holiday will become progressively more important. Consider, too, where you will be sleeping. A self-catering chalet may sound idyllic, but adding cooking to what is already going to be a packed schedule is likely to be a step too far. It can work and keep the costs down if you are holidaying with one or more sets of friends with their own kids, when catering can be shared around the adults. Otherwise, do yourself a favour and opt for the hotel option – it will make stress levels manageable and prevent you returning home regretting that you ever went in the first place. Plan, too, for your journey to and from the resort. Travelling with children is rarely straightforward, but when you have to juggle with extra gear and skis, then two hands are going to feel inadequate to say the least. So be economical in your packing to cut down on suitcases and excess baggage charges, and leave plenty of time to get to the airport and check-in to avoid the children being embroiled in a last-minute dash or crush to get through passport control and security. Finally, think carefully about when you are planning to go. In the past, schools have been relatively lenient when it comes to parents taking their children out to go on holiday. However, many are becoming much tougher. Yes, everyone knows that operators exploit the relative lack of flexibility by charging more for their packages during inter-term and half-term periods, but it is better to swallow the extra cost than compromise your relation with the head teacher or your child’s study schedule. The key to a successful family holiday on the slopes is careful planning. And if all this leaves you pining for those long, lost days when you were carefree and single, take a look at the party people who manage to stumble down to the breakfast buffet one morning. Those bloodshot eyes and pale complexions should be enough to convince you that winter holidays en famille do have their advantages.